16th century castle with secret passages and a dungeon. Historic home of the Campbells. 9 miles north of Oban in the West Highlands. Set on the shore of Loch Creran. Magnificent views of Glencoe. B&B is offered in 6 bedrooms (4-poster, double and twin). All with loch or countryside views, bathrobes, slippers, hairdryer, toiletries, flat screen HDTV with Blu-ray/DVD player, mini hospitality hamper, mineral water, tea/coffee, etc. Full Scottish Breakfast in the main hall. Rent a castle - ask about 'exclusive use' prices (all 6 bedrooms). Luxury 5 star hotel with 26 individually designed bedrooms and suites, including a penthouse. Set on the banks of Loch Faskally, just a short walk from Pitlochry in Perthshire. Close to Pitlochry festival theatre and Blair Athol Distillery. Ideal for golf. Brassiere and Fine Dining restaurant. Leisure club and spa opening soon. Opened in 2013. Winner of Rural Hotel of the Year in the Scottish Hotel Awards 2014. Historic castle dating back to the 14th century and once owned the family of Robert the Bruce. Set in 14 acres of wooded parkland, 10 minutes from Stirling. Leisure facilities include swimming pool, gym, sauna, steam room, solarium. Aromatherapy & beauty treatments available. 2 restaurants, 2 bars. 125 bedrooms and suites. 13th century castle set in wooded parkland 7 miles south of Edinburgh. 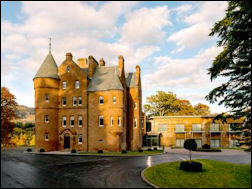 Winner of Castle Hotel of the Year 2009 in the Scottish Hotel Awards. 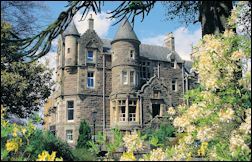 Luxury accommodation in 29 bedrooms (some with historical themes of kings & queens, Robert the Bruce, William Wallace, etc. with 4-poster bed, period furniture, tartan & tweed). Award-winning Dungeon Restaurant (2 AA Rosettes). Hydro spa with pool, sauna, steam bath, etc. Facilities for ceilidhs, weddings, banquets, conferences, etc. Falconry within the grounds. Built in 1837 on the shores of Loch Fyne. 2 miles from the picturesque fishing village of Tarbert. Set in 60 acres of woodland gardens with a fine collection of Himalayan Rhododendrons. Award-winning restaurant (AA Rosette) with views over the gardens and Loch Fyne. Wood panelled lounge bar. Choice of 32 ensuite bedrooms. Recommended by Cond� Nast Johansens. Ideal base for exploring Argyll & the Kintyre peninsula on the west coast, also the islands of Gigha, Islay, Arran, Bute. 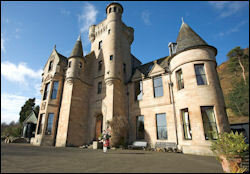 Baronial castle built in 1896 offering Victorian elegance and luxury accommodation. Friendly, family-run establishment with genuine hospitality. 18 ensuite bedrooms all with TV, direct dial telephone, hospitality tray, toiletries, hairdryer, trouser press. Choice of king sized double or twin beds, or superior bedrooms with super king sized beds. Restaurant with award-winning chef. Lounge bar serving bar meals. Situated in Pollokshields on the south side of Glasgow, just 3 miles from the city centre. 15 minutes drive from Glasgow International Airport. 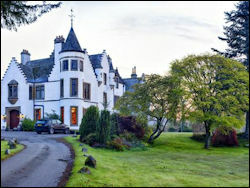 16th century tower house, country manor & steading set in 20 acres of private gardens & woodlands. Retaining its original character, it offers exclusivity and seclusion. Public rooms include the Great Hall, Library and Old Drawing Room. Close to Uphall Golf Course. 7 miles from Linlithglow and its ancient palace. Less than 10 miles from Edinburgh Airport. Choice of 71 ensuite bedrooms. 24-hour room service. Award winning restaurant with 2 AA Red Rosettes, and vaulted bar with lounge bar menu. Leisure Club and Beauty Spa with 18 metre swimming pool, sauna, steam room, gym and beauty treatment rooms. Outdoor tennis court. Luxury country house hotel set in 50 acres of woodland in a secluded location on the bank of the North Esk river. Only 6 miles from the centre of Edinburgh. Built in 1786 on the site of the old medieval castle for the first Viscount Melville. Surrounded by 3 golf courses. 4 star bed and breakfast accommodation with a choice of 32 bedrooms - all uniquely furnished - including luxury four-poster rooms and suites. Dinner is available in the Brasserie Restaurant in the vaulted cellar. Library bar overlooking the lawns and fountain. Beautiful mansion house built in 1536. 5 minutes from Peebles in the Scottish Borders. Only 40 minutes from Edinburgh City Centre. Set in 25 acres of mature gardens and woodlands with splendid views of the surrounding Moorfoot Hills. Choice of 78 bedrooms. Restaurant, conservatory and courtyard garden. Leisure facilities include indoor heated swimming pool, multi gym, sauna & spa bath. 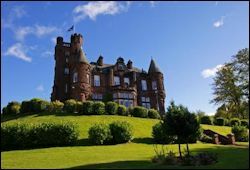 Former 19th century baronial home of Scottish shipping magnate Lady McBrayne. Set in 3.5 acres of wooded grounds near Crieff in Perthshire. Leisure facilities include a swimming pool, sauna, steam room, spa bath & gym. Numerous beauty treatments & therapies available. No children. Choice of ensuite bedrooms (single, double, twin) all with TV, telephone, free WiFi, toiletries, hairdryer, tea/coffee. 4 Stars. Restaurant. Rooftop lounge. Room service. Concierge service can arrange golf, fishing, etc. Romantic Hotel of the Year 2014, Winner of Hospitality Gold Medal and Real & Local Food Gold Medal in 2010 in The Scottish Hotel Awards. Family-run small hotel with a relaxed atmosphere. 5 miles from Stirling. Set on the slopes of the Ochil Hills with fine views. 20 minutes drive from Gleneagles. Baronial mansion built circa 1874 in the style of Balmoral Castle. 1 hour from Edinburgh. 10 ensuite bedrooms refurbished to a high standard (7 double, 1 twin/family room & 2 four-poster rooms). Licensed for civil wedding ceremonies. Facilities for conferences. 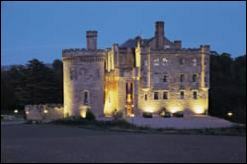 Scotland's first newly built castle of the 21st century offers luxurious, stylish boutique accommodation. Choice of dining at the Castle Bar & Grill or the adjacent award-winning Glenskirlie House Restaurant. Centrally situated. 11 miles south of Stirling. Glasgow 18 miles. Edinburgh 35 miles. Choice of 15 individually decorated bedrooms with bath/shower, hairdryer, toiletries, bathrobes, flat screen TV, DVD player, Ipod docking station, telephone, Wi-Fi access, tea/coffee, mineral water. 24 hour room service. 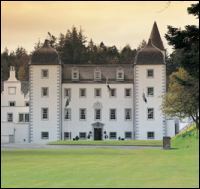 Once the family seat of the Mackenzie clan. Built in the early 1800s. Scottish Tourist Board 4 Star Country House Hotel with grounds and extensive views towards the Cromarty Firth. 25 miles north of Inverness. 20 miles south of Dornoch. 15 indivually styled ensuite bedrooms. All with satellite TV, controllable heating, hairdryer, tea & coffee, toiletries. Free WiFi. 24 hour room service. Elegant restaurant, lounge and bar. AA 4 Stars & 2 red rosettes. Recommended in the Michelin guide. 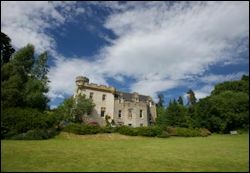 Tulloch Castle dates from the 12th century and was home of the Chiefs of Clan Davidson. Situated on the edge of the market town of Dingwall. 15 miles north of Inverness. 4 Stars. Recommended by Cond� Nast Johansens. Choice of 20 en-suite bedrooms (single, double, twin), each with its own unique charm and character. Breathtaking views. Elegant candlelit restaurant. Whisky bar. Ghost tours to explain the history of the 'Green Lady'. Secret passage, dungeons, etc. Reception hall with ornate ceiling, wood panelling, log fire. 15th century castle in the centre of Dornoch across the square from the Cathedral where Madonna was married. 1 hour's drive north of Inverness. Choice of 21 en-suite bedrooms including some with four-poster bed. Garden Restaurant with AA Red Rosette for excellent food. Built in the late 1870 and set in 3. 5 acres of picturesque countryside, with award winning cuisine and magnificent oak panelling throughout. 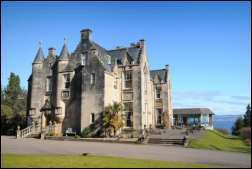 19 individual bedrooms with views over the castle grounds, the Moray Firth and the Dornoch Firth. All rooms are en suite, some with whirlpool bath. Elegant dining room with picture windows overlooking the grounds. Scottish Tourist Board 4 Star hotel in a peaceful location in rural Aberdeenshire. Set in gardens and woodland near the ruins of old Kildrummy Castle. Victorian mansion house with elegant restaurant, lounge bar, antiques, and many original features such as wall tapestries, oak panelling, hand carved staircase, etc. Choice of 16 ensuite bedrooms (all with TV, telephone, hairdryer, etc.). Friendly staff and good food. Close to golf courses, horse riding, distilleries, fishing, etc. 45 minutes drive from Aberdeen. 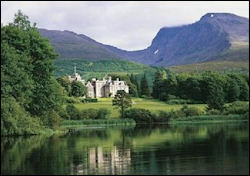 Luxury 5 star country house hotel close to Ben Nevis. Just 4 miles north of Fort William. 17 rooms & suites with views of the grounds and mountains. Room facilities include telephone, TV, CD player, radio, WiFi, etc. Restaurant with AA 3 red Rosettes and 1 Michelin Star. 24 hour room service. 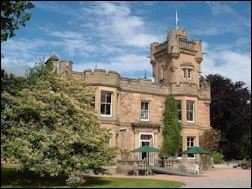 Castle Hotel of the Year 2015 and Restaurant of the Year 2015 in the Scottish Hotel Awards. Recommended by Cond� Nast Johansens. Walled garden, snooker, tennis, loch fishing, clay pigeon shooting, falconry. Balfour Castle Shapinsay, Orkney Hotel. My page inc. details of accommodation & weddings. Available for B&B, self catering, accommodation, weddings and private events. Hotel. Available for weddings. Self catering cottages in the grounds. Available for exclusive use. Weddings. Faside Castle near Edinburgh B&B suite in the tower. Self catering on the estate. Official web site. 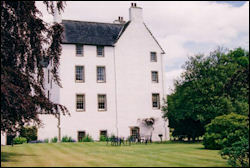 Fenton Tower East Lothian Recently restored to offer 5 star quality luxury B&B accommodation. Fernie Castle near St Andrews Official site. For dinner, B&B, weddings and corporate events. B&B accommodation. Dinner optional. On the shores of Loch Oich between Loch Ness & Loch Lochy. 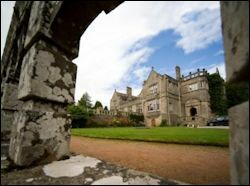 Castle & grounds are licensed for civil weddings. Kilconquhar Castle Elie, Fife Kilconquhar Castle Estate - accommodation, timeshares, weddings, conferences, banqueting and private functions. Castle Levan Gourock, near Glasgow Official web site. Traquair House Peebleshire Scotland's oldest inhabited house. B&B accommodation, corporate entertainment and weddings. Owned by the National Trust of Scotland. Available for weddings, corporate events, exclusive use. Located near South Queensferry, only 8 miles from Edinburgh. 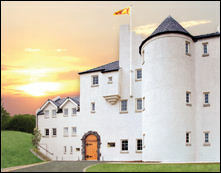 Kilconquhar Castle Elie, Fife Kilconquhar Castle Estate - self catering accommodation, timeshares, weddings, conferences, banqueting and private functions. 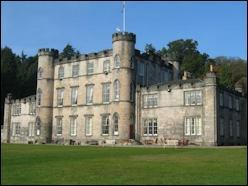 Neidpath Castle near Peebles Official site - accommodation, weddings, events. Detailed online info about Travel, Transport, Accommodation, Weddings, Sightseeing.